Whether copywriters develop website copy or an advertisement, we use expertise, research, and client feedback to create the best content possible. Proper feedback, in my opinion, is descriptive (not prescriptive). That means clients describe what they don’t like about the copy and tell us why they feel that way in relation to their end goal. This leaves it up to us (the hired experts) to come up with a solution. Copywriters should take responsibility for managing client feedback. After all, this might be the first time your client has ever worked with a copywriter. Taking responsibility not only gives us some dignity for our work, but it also helps our clients’ projects succeed. Since I may not get everything perfectly right on the first try, it’s important for me to know what’s not working for my clients. And with feedback, it is my job (as the hired expert) to come up with appropriate solutions to fix these issues. Ask why. If you were not sure what I was thinking, I’d love to explain my reasoning. Everything I’ve done for the project has a purpose. Refer to your goals. Relate every piece of feedback and criticism back to the goals we set at the start of the project. Relate to your audience. Your audience should be on the top of your mind for every critique you give. What do they need? What will they love? What won’t they like? That’s it! All it takes is a simple e-mail asking them to read this over before reviewing your work. Feel free to use this as an example to educate your own clients. It’s little things like these that will keep our clients happy! Digital content consumption has now reached a speed that could give Elon Musk’s SpaceX craft a run for its money. In 2010, Google CEO Eric Schmidt declared that people were then exchanging five exabytes of data every two days. That’s about the equivalent of around half a million replicas of the Library of Congress being exchanged every two days. So, is it better for your company to hire freelance copywriters whose only intent is to make your information consumable to the world? Probably, yeah. Hiring outside professionals has many hidden benefits that, when broken down, far outweigh the perceived costs. Let’s look at that in more detail with a list of five reasons to hire freelance copywriters for businesses of all shapes and sizes. In the spirit of getting paid, freelance copywriters must work as efficiently and professionally as possible. Time is their bread and butter and they have no choice but to use it wisely. As speed and quality can only exist together in the hands of an experienced professional, it’s in the best interest of freelancers to continuously hone both their trade and time management skills. This efficiency transfers to your business. An ancient Chinese proverb states: “The hunter who chases two rabbits catches neither.” For the sake of this comparison, let’s just say that one of those rabbits is the smooth-running operations of your core business functions, and the other is your online marketing communications. For most companies, trying to keep your business running, while learning to attract new customers with beautifully crafted prose, has a tendency of becoming rather counterproductive. With the concentrated skills that freelancers provide, companies are able to streamline their focus on core procedures, while their copywriter(s) assist in maintaining a strong presence in growing digital marketplaces with blogging, e-mails, social media, and SEO-driven web content. It has been said that it takes 10,000 hours to become an expert on anything. Whether that theory is entirely true or not, it does stand to reason that the more time spent focused on learning one thing, the more knowledge and experience a person gains in that one thing. Some of the best copywriters freelance for a living. Most have been in the business long enough to be able to successfully write from home. They have also usually taken all of the wrong paths enough times to be able to quickly identify the right route to a successful outcome. Outsourcing your content creation eliminates the time (and budget) consuming process of finding and hiring copywriters to handle your content. With full-time employees, your bank account has to contend with downtime, Facebook surfing time, illnesses, and emergencies. With freelancers, you don’t have to pay for their health insurance or time off. So, you won’t find yourself the recipient of some lame excuse – fashioned to obtain paid sick leave – like an employee having to stay home because they have been bitten by their goldfish, who had contracted some unheard disease, while it was somehow traveling in the Himalayas. Over time people can become so ingrained in their company that it is difficult for them to make impartial decisions about brand messaging. Outsiders can provide different perspectives, creating new ideas that expand on your business’ capabilities and allow it to fulfill its true potential in an ever-changing digital marketing environment. With the Internet available at all times, across many different devices, any change of attitude towards advertising spreads like wildfire. This makes it imperative for organizations to not only build a strong brand voice, but also to keep their messaging fresh and relevant across many different formats, devices, and social media platforms. And there you have it. You’ll receive many other benefits when you hire freelance copywriters (like the qualified professionals at the Copywriter Conclave of Portland). We just picked a small collection of the some of the best reasons. A few months ago, I wrote a post called 5 Co-Working Spaces in Portland. After all the comments I received, it became clear that I had NO idea what I was talking about. By combining everyone’s additions, it looks like there are at least 13 co-working spaces in Portland! In an effort to keep them all in one place (instead of forcing you to scroll through all the comments to find them), here is the total list of co-working spaces in Portland that we co-created. Awesome work, everyone! This has turned into an awesome collaboration! If you know of other co-working spaces or resources that I’ve missed, add them in the comments to make this list more complete. Now go forth and co-work! Recently, I received a client referral for a small, yet mighty copyediting project. The client needed me to copyedit three case studies and a bid letter. Seemed like a quick-turn project that could be fun, so I said yes. What I didn’t realize was that it would blow my mind a little. The case studies weren’t the case studies I’m used to dealing with. They were 300 words long or less! (I know, right?! Take a second to recover.) This revelation was so mind-blowing because my colleague, Mike Russell, challenged me and a few others to write case studies for ourselves as freelance copywriters. We all kind of hemmed and hawed and never did it, but now, seeing the wonder of the 300-word case study, I’m totally going to do it! 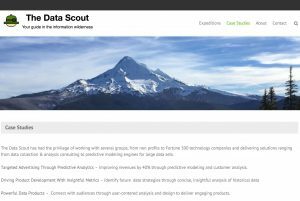 Because my client, Sev of The Data Scout, has posted the wonder-full case studies on their website, I will share them with you. I recommend you read them and get an idea of how you could write your own case study similarly. The purpose of these studies is to give prospective clients a clear, concise idea of work I’ve done and value I can add. Totally. Boiled down to its essence, that is the role of the case study. Why, then, do we make them so long and complex if we can make them so short and simple? Good question. I suppose it depends on industry standards around case studies, how much information you/the client wants to include, and what you/the client think a case study should be. As writers, we know it often takes longer to write short pieces than it does to write long pieces. In shorter pieces your words have to be immediately impactful, exact, nothing wasted. Longer pieces can start slower, have some fluff, and include the kitchen sink. It’s pretty subjective. The point of this post is to inform you that there’s another way to do case studies. If you’re like me and thought they had to be long, dramatic, and filled with professional photography and diagrams, I hope you feel relief and empowerment now knowing that you can create 300-word case study wonders. For yourself AND your clients! Whoa…Did that just blow your mind too? To whom do you send it? Where is pretty much covered under whom. Why do you need to include all the things I’m suggesting? These will be discussed in-line with the topics. How do you send the invoice? Send it to at least two people: your primary point of contact and an administrator in their office. The reason I recommend sending it to at least two people on the client’s side is because people lose things. I’ve worked with at least three clients who’ve forgotten about my invoice. It was only after I followed-up with them a month later that they said “Oh, um, right. Can you send it again? It got lost in my email. So sorry.” Sure. I email them the invoice again, they confirm receipt, and then three or four more weeks later my check arrives in the mail. Not cool. By sending it to two people AND being diligent about following-up, you’re less likely to have overdue invoices. I wanted to check on the status of my invoice for the editorial calendar project. I emailed the invoice to you on January 10th. Can you tell me when I can expect payment? At a minimum, you’ll want to include these bits of information because they are directly related to you receiving the correct payment for your work. Make this information prominent, put it in bold, make it colorful. However you do it, make the information clear. Credit for the due date innovation goes to freelance business attorney Katie Lane of Work Made For Hire. Depends on the project. If you’re working on a longer-term project like the one in my example, you’ll likely end up billing in parts. 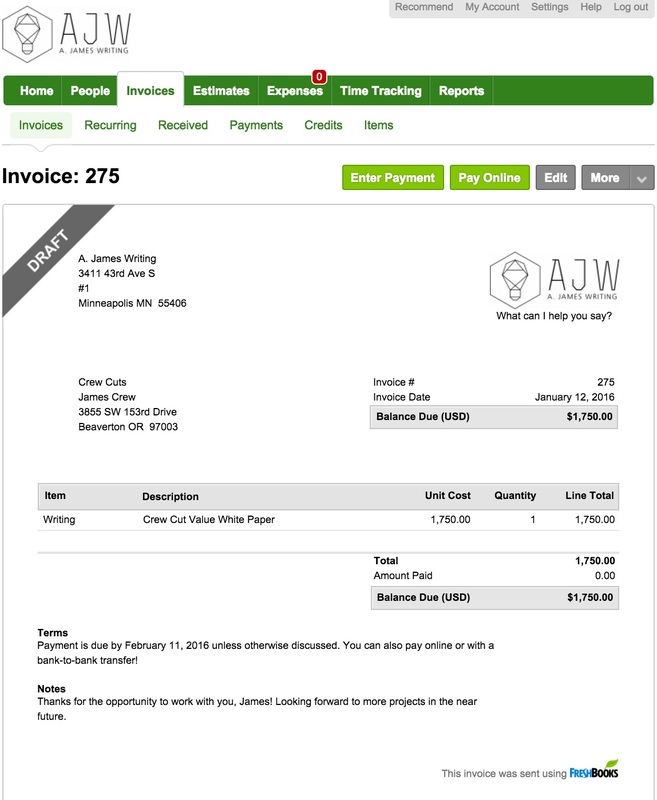 For this example project, there are three invoices planned. 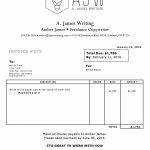 The first invoice is sent before work begins / as soon as the terms and timeline are agreed upon, the second goes out after the first draft is done and submitted, the third is sent after the first revision is completed. Why? So that way your invoices (and thus, your receiving payment) are dependent upon YOUR actions, not those of your potentially forgetful client. If you’re working on retainer for a client (good for you!) you’ll likely bill them monthly. If you’re doing a consulting project you could ask for 100% up-front and invoice beforehand. For a large project like my example, you could also invoice for 50% up-front and the rest after the first revision. For smaller projects, I send my invoice after the work is sent, revised, and accepted by the client. These projects are usually pretty short-term, so waiting until it’s finished (two weeks max) is no hardship. Bear in mind, you can invoice for whatever percentage of your fee, whenever you want, as long as you’ve communicated the schedule to your client as part of the project plan. Some practices don’t always feel comfortable to the client, however. For example, invoicing for 100% up-front, with a first-time client, for a many-months long project. Just food for thought as you choose your invoicing practices. 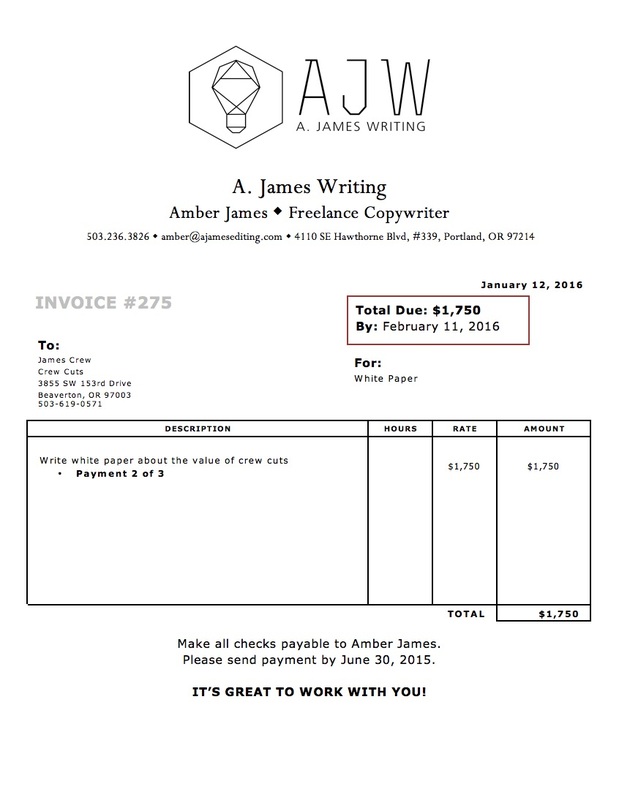 When I started freelancing in 2009, I did the first method mentioned above: Word doc invoice template, saved as a PDF, attached to an email, and sent to the client. Then my colleague, Mike Russell, told me about Freshbooks. At first I balked at having to pay $19.95 per month for the privilege of sending invoices that I could just send for free. Then I realized how lovely it could be to accept credit card payments (read: get paid faster), link the whole thing up to Gusto (formerly Zen Payroll) for all the tax-related stuff, and keep track of my business account expenses. Those were some of the selling points that made me convert to Freshbooks. Oh, it also allows you to set up automatic late payment reminders. That feature has come in handy for me more than once. There are other services out there that do what Freshbooks does. I’ve heard from CC: PDX prez Mahesh Mohan that Pancake is also a good option for invoicing. 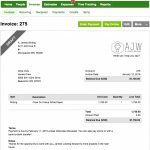 If you have no interest in paying to send your invoices, I’ve heard of no stigma around the tried-and-true PDF attachment method. When you decide it’s worth it for you to spend money on this sort of service, know that Freshbooks and Pancake are used and recommended by members of the Conclave. The invoice is amazing. It is that which enables us to get paid for all our creative works. Learn it. Live it. Love the invoice! It can be pretty or plain, simple or elaborate, but it MUST communicate those four things clearly. As an ending thought, I’d like to leave you with some wisdom from money coach Shell Tain. She strongly recommends sending your invoices and following-up in a timely fashion because if you don’t, your clients will get the impression that you don’t care about being paid. In turn, they won’t care about paying you. And we can’t have that. What additional questions do you have about the miraculous invoice? What methods do you use for billing?